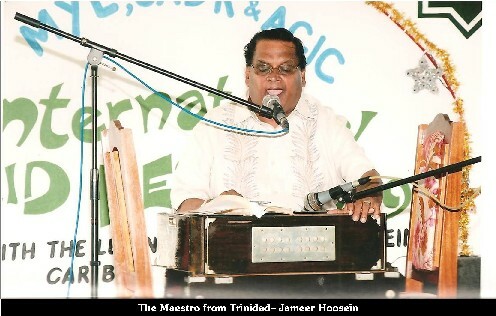 Guyana, September 27th 2009:- Jameer Hosein, wowed the capacity crowd at the 6th Annual EID FEST today. The full to capacity audience included Minister Manzoor Nadir, Dr. Prem Misir from the Office of the President, Regional Chairman Julius Faeber and the Mayor of Georgetown Hamilton Green, In a press release Raymond Azeeze is quoted “the voice of Jameer resounded into the air as the audience stayed enthralled by his magnificent performance”. Hosein utilizes the singing of qaseedas (Muslim devotional songs) as his form of invitation to Muslim culture and practices. He is considered the best qaseeda singer in Trinidad & Tobago. Eid Fest is hosted by Muslim Youth League of Guyana, The Guyana United Sadr Islamic Anjuman and the Anna Catherina Islamic Complex. [Jameer Hosein, was born in Freeport, Trinidad and grew up in a family where his father, the late Hosein Ali and his uncles practiced singing in the village for weddings and other social functions. Against this background, he became very fond of singing and spent his early years under the watchful eyes of the late Isaac Yankaran in the Naya Sangeet Orchestra. Hosein who is a senior sales representative at Southern Sales Company Limited now resides in Kelly Village, St Helena, Trinidad. He is the father of five and grandfather of twelve. While there were many singers who inspired him to keep singing the classical songs, he has been self taught. As a youth he spent many years researching and writing materials to sing. Today he is contracted to sing classical, film songs, bhajan, and gazals. It was in 1972 that Jameer struck gold when he placed first on TTT’s Mastana Bahar programme. From then on he began recording his voice and travelling to many countries of the world. He has since performed in Holland, Guyana, St Vincent, New York, Miami and Canada. In 1998 he proved that he is still a winner when he took the National Classical Singing competition. Through the years he received numerous awards from bodies such as ASJA and Hindi Nidhi. “I remember the days when I would dominate the stage singing with front line bands such as Nau Jawan Orchestra. Under the leadership of Chander Bali the band was contracted to perform in many of the national shows taking place in Port-of-Spain,” he informed. Later he moved on to the Naya Zamana Orchestra where he toured extensively. 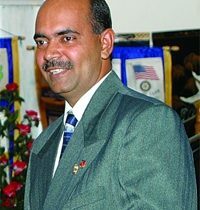 His final band stint was with the BWIA National Indian Orchestra under Maestro Harry Mahabir. He became popular singing all the hit songs coming out of India. Jameer spent more than twenty years singing in bands (Film Songs) under the best musical directors including Ustad Nazir Mohammed, no wonder he is considered today as the master of melody. In the early sixties he was advised by the late Isaac Yankaran to try a few classical songs which he did with great success although he found some difficulty not being able to play the harmonium which is an integral part of classical singing. After the death of his mentor the late Isaac Yankaran, and in his memory, Jameer not only mastered the art of playing the harmonium but kept the flame of classical singing alive. Commenting on the artistes of today he said that the youths are not taking the time for proper training but are in a hurry to become a super star over night. He said, “Long ago one must be able to master the Hindi and the Urdu language. Only then you can sing. Today many of the singers sing because they love the melody and they don’t have a clue as to the meaning of the songs they are singing,” he said. He laments the fact that there is a lot of bickering and confusion among East Indian artistes and he called on them to unite and allow each other to grow within the fold of culture in Trinidad and Tobago. Jameer Hosein has been singing for more than fifty years. He remains one of the top classical singers the country has even seen. He is married to the dedicated wife and mother of his children, Zalina Hosein for the past 45 years. Be the first to comment on "Trinidad’s Jameer Hosein thrills Guyanese audience"